It’s no secret the wonders meditation can do to your body and soul. From reducing stress to improving your sleep, a good session will positively impact your general well-being. In order to reap these benefits, you need to be seated in the correct position during your session. And that means using the correct props: a meditation cushion being one of them. 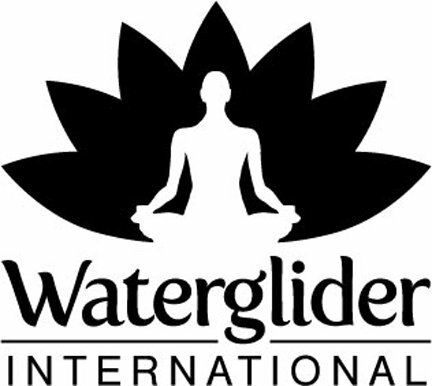 Did you know 99.9% of people who practice yoga can’t sit in the lotus position comfortably with no back support? Ask any serious yogis and they’ll tell you the importance of adding a yoga cushion to your yoga ritual. Apart from providing your body with that much needed support, you’ll also enjoy extended periods of meditation without aches and pains. Picking the best meditation cushion can be pretty overwhelming. What’s a Yoga Cushion Used For? If you’re new to yoga you’re probably debating the importance of a yoga cushion. This is the traditional type of yoga cushion. It’s characterized by a round, elevated pillow shape. This design will enable you to easily lift your pelvis from the ground while providing your knees with support. If you’re new to yoga you might want to opt for this type because it’ll do wonders for your spine & hips. 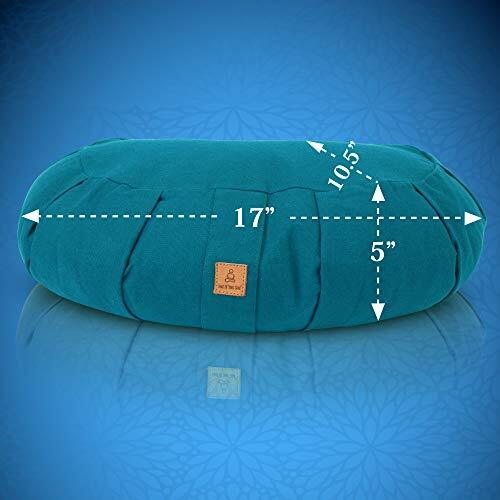 This meditation cushion is different compared to the Zafu in that it’s larger, flatter plus it isn’t elevated. This cushion is similar in height to the Zafu but it’s designed to support the full length of your legs and encourage your pelvis to tilt forward. This will make for a more comfortable sitting position. Zen pillows are rectangular in shape and sitting on them provides support for the top of your thighs. You can get the best of both worlds by using a combination of both the Zafu and Zabuton. This common practice in the yoga community will see you enjoy complete body support and you’re guaranteed maximum comfort. 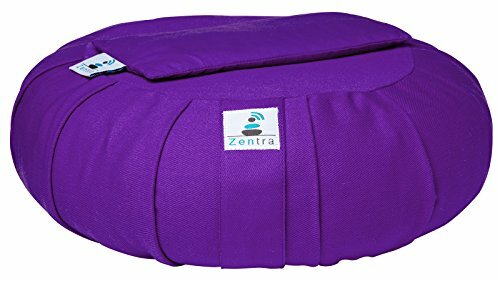 Simply place the Zabuton on top of the Zafu and you’re on your way to an improved meditation experience. However the style of cushion you decide on will depend on your personal preference. The idea of meditation is to ultimately reach a worry-free state. Worrying about aches and pains during your session defeats the whole purpose don’t you agree? Adding a meditation cushion comes with great benefits for your body. Since you’ll be sitting for long periods of time, assuming the correct posture is important if you want a comfortable session. A yoga cushion will help influence the meditation posture and your body alignment. When it comes to meditation, it’s all about comfort. Thanks to yoga meditation cushions, comfort is exactly what you’ll get. The idea of sitting on the cold hard floor during your yoga session doesn’t sound appealing. Did you know if your body isn’t properly supported, it’ll eventually give way to the shape of whatever surface it’s resting on? If you’re sitting on the ground your spine, hips and shoulders can become misaligned which can lead to serious discomfort. A meditation cushion is ergonomically designed to hold your body in proper alignment while you’re sitting for prolonged periods. his way you can prevent poor body postures like slouching. Sitting on a cushion will help increase blood flow through your body since you’ll be seated in an elevated position. This allows for blood to properly flow to your legs and feet. And if you’re planning on sitting for long periods you’ll definitely want to add this to your yoga session. Also select one that comes with a handle. That way location will not to restrict you from meditating anywhere. Meditation cushions are generally expensive so knowing what to look for will ensure you make a worthwhile investment. With so many cushions to choose from how will you know which one will be ideal for your needs? While factors like price play a huge factor in your decision to purchase, try to pick a quality cushion to ensure durability. Yes, cheaper cushions might seem like a bargain, but not only will they quickly wear out, they won’t provide you with the adequate support you need. Opt for quality cushions which are versatile and adjustable so you get value for your money. Be warned that some manufacturers design cushions that won’t allow you to adjust the stuffing inside your pillow. As a result you’re forced to replace it when it gets flat and dirty. Below are a few attributes to look out for which will hopefully help you make a practical selection. Height of the cushion is a very important consideration. This will determine how high off the ground you’ll be seated which will ultimately impact your comfort levels. Too low will cramp your knees while being too high won’t be comfortable. 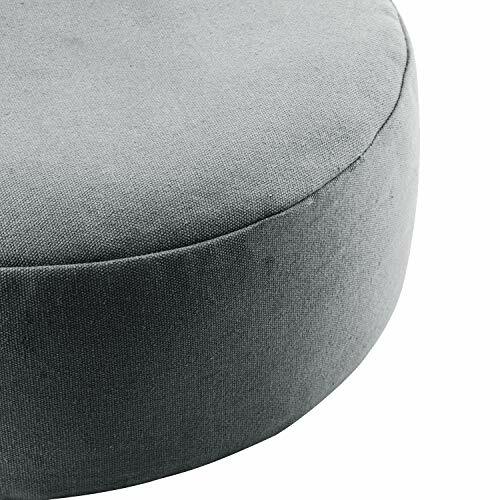 Meditation cushions come in different shapes meant for different positions. If you’re going to be doing half or full lotus positions, a round pleated cushion will be ideal. This type of cushion will lift your hips up to allow your legs to rest comfortably. The material the cushion is made of will determine its durability. It must be able to withstand regular use. Make sure the fabric is not only strong but soft too. After all the softer the cushion the more comfortable it’ll be. Cotton is an excellent choice because no matter the climate you’re in it’s not unusual to sweat while meditating. It’s easier to clean sweat stains from this fabric as opposed to cushions made of silk. Cushions made of kapok cotton, wool are not only durable but attractive too. Kapok is a soft natural fiber which is naturally silky and resilient. The cushions are made of different stuffing which you should take note off. The material the stuffing is made of will make the difference between a comfortable cushion and a lumpy one. And it’ll also determine if the cushion stays in shape or not. Make sure it’s soft yet durable and easy to maintain. Note: If you purchase a cushion with a zipper on the stuffing you’re able to replace the stuffing if it gets too old or thins out. Also note a cushion with a removable outer cover makes for easier cleaning and maintenance. Below are a few types. These grains make for excellent stuffing because the pillow not only retains its cushioning ability for years but also shifts and moves to conform to your shape making it a custom fit. Picking a cushion filled with buckwheat will allow you to either add or remove whatever amount of stuffing you want so the cushion is as hard or as soft as you need. This type is usually more expensive though. It’s not commonly used in meditation cushions because it tends to lose its fluffiness quickly and isn’t soft. But if you’re allergic to other materials it’s an excellent selection. Stuffing made of polyester or foam tends to lose its buoyancy quickly. However, they’re the softest kind of stuffing and will be ideal if you have sensitive hip joints. These cushions come in a variety of colors to choose from. Did you know the color of the cushion directly impacts your mood and ultimately your energy levels? Looking for the ultimate relaxation experience? 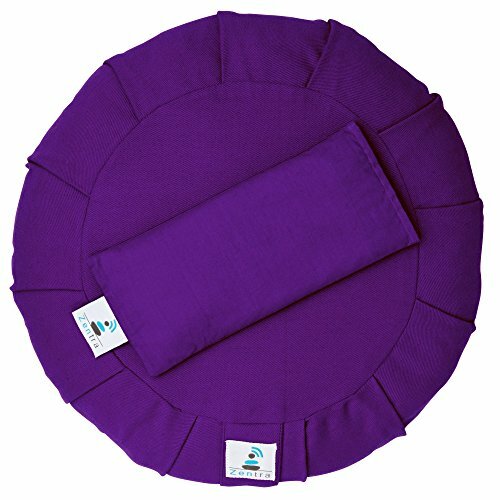 You might appreciate this yoga cushion because it gives you a soft yet stable foundation for a comfortable meditation experience. Quality is synonymous with this cushion because it’s cover & inner lining are made of premium organic cotton. This cushion will perfectly mold to fit your bottom since it’s filled with natural buckwheat hulls. You can easily adjust this cushion to suit your needs by removing some of the stuffing. You don’t have to worry about incorrect posture and pressure being exerted on your hips & legs thanks to its ergonomic design. It helps align your spine as well. Are you tired of cushions that lose their shape after a few uses? That will be the least of your worries with this high-quality cushion designed to maintain its shape. And you can travel with it anywhere thanks to its portability and carry handle. For increased options this cushion comes in a variety of styles and colors to pick from. However note some customer reviews have indicated insect infestations. Say goodbye to aching pins and needles in your feet after each yoga meditation session if you pick this cushion. 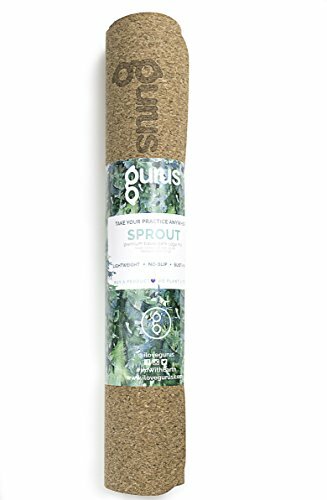 This bolster provides you with a boost from hardwood floors thus relieving strain from your hips, knees and ankles. Cleaning up after your session will be a breeze thanks to the full zip feature this cushion has. You can remove the outer cover for easy maintenance. The cotton cover is machine washable. The stuffing is made of buckwheat hulls which are sealed in a pouch for easy removal and insertion. Plus it’s available in different shapes to fit different body needs so you’re bound to find one that’ll suit yours. It comes in a variety of colors and vibrant designs so you can select one that matches your personal style and taste. 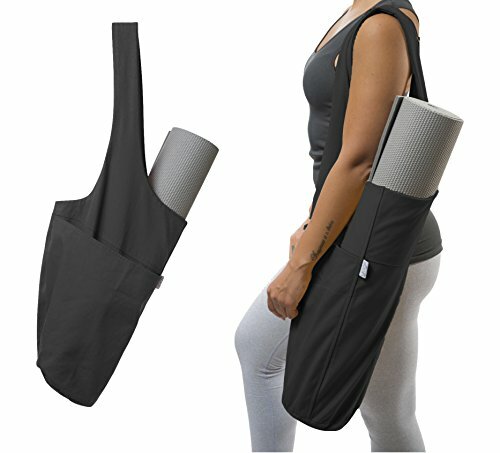 You can practice your yoga anywhere because it also features a grab and go handle which makes it portable. This yoga cushion is just the right balance of firmness and pliability. Looking for a comfortable cushion? You might appreciate this cushion made of soft fabric. It’s tightly packed with buckwheat hulls for firmness while also being soft enough to conform to your body’s needs. Maintaining it won’t be a nightmare because it has a removable cotton cover and full zipper for easier removal and cleaning. You can carry it around anywhere with ease thanks to its sturdy carry handle. 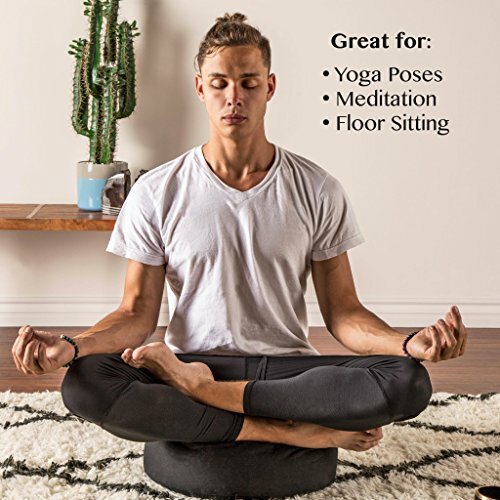 Whether you’re a beginner or a veteran in yoga you’ll find this cushion useful because it helps you relieve stress on joints plus properly align and support your spine. It comes in three size so you can choose one you’ll feel most comfortable using and carrying. Sure, you might spend a few extra dollars on this particular cushion but it’s well worth it. This pillow is made of organic cotton making it a high-quality cushion. The buckwheat used to stuff the cushion is purchased directly from the farm so you’re guaranteed quality. These cushions are individually handmade so greater care is exercised during stuffing and assembling making it a high-quality cushion. They come in six vibrant colors so you’ll find one that matches your mood and personality. If you don’t like the traditional round shape, you can opt for the crescent shape also in the same colors and quality. It has a convenient handle which hides the zipper located underneath. The cushions are overstuffed for increased firmness but you can easily empty out extra stuffing if you desire your cushion to be less full. And you can add it later if you wish which is quite convenient. However you might not like that it doesn’t have a removable cover so cleaning it might be tricky. If you like freebies you’ll like this cushion because it comes with a bonus eye meditation pillow. The eye pillow is perfect for any meditation practice that requires lying down. The cushion itself is made of premium grade high GSM fabric which is strong stitched making it both durable and dependable. Zentra products are made built to last so expect nothing less from this cushion. This cushion is suitable for all types of meditation and you can also use it as a general floor cushion while you’re watching TV. Add a pop of color to your living room by using this cushion as an accessory. If this cushion doesn’t meet your satisfaction you can return it for a full refund. Now that you have all the information and specs which one is the best meditation cushion for you? 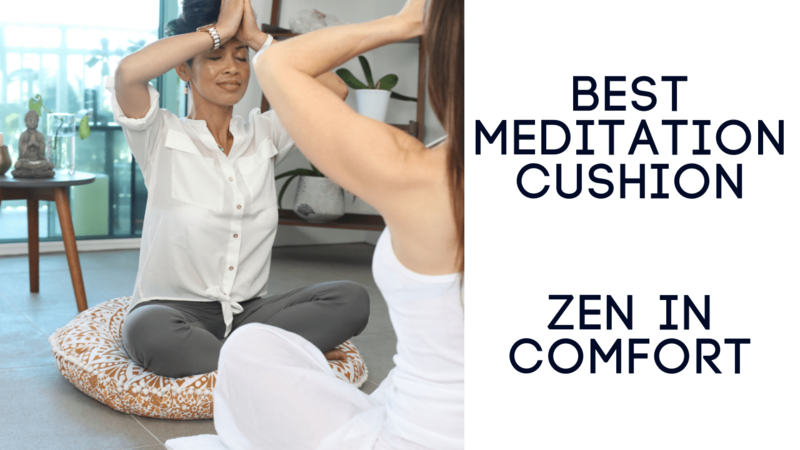 The Zentra Yoga Meditation Cushion is a clear winner for us. Why? First, we love that it comes with a bonus eye pillow. Second, lavender is a gorgeous color making the pillow pretty attractive. But if you don’t like that particular hue, it comes in a wide variety of vibrant colors including navy blue and black. So you can spruce up your living room with this cushion if you feel it’s too good to sit on. As for its actual purpose in terms of yoga, it’s quite sturdy and made of premium quality fabric so durability is guaranteed. With the price of these cushions the last thing you need is a cushion you’ll have to replace in the near future because it’s torn or worn out. The strong stitching guarantees otherwise. Remember this one is adjustable and you can remove the stuffing to suit your needs. We hope it works for you too.